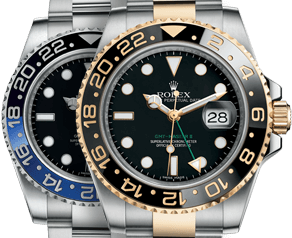 Rolex GMT Master II Mens Two Tone watches combine solid 18K yellow gold and steel. BeckerTime offers a collection of used two tone GMT-Master II watches with a variety of dials, bezels, and band types. Also, we feature the popular black & red “Coke” bezel option. By browsing our selection, we’re sure that you will find a pre-loved Rolex timepiece for your style and budget. Now, you can experience the luxury of owning a genuine Rolex GMT watch, but at a used Rolex GMT price. In addition, BeckerTime offers a 30-day money-back guarantee with each purchase, as well as a Lifetime Trade-Up Guarantee for qualified items. To learn more, we welcome you to browse our entire online collection of pre owned Rolex watches. We also provide personalized customer service. So, please don’t hesitate to contact us if we can help you find that perfect fit or special gift. All watch brands come with their fair share of advantages and disadvantages. But Rolex watches have proved successful in all aspects throughout the years and this will in all likelihood continue for the foreseeable future. So if you are in the market for a watch with unique features, quality and precision, then you are right where you need to be. The GMT-Master II two-tone model is the watch! There could be any number of reasons you are here taking a look through our fine inventory of used Rolex Two-Tone GMT Master II watches. You might be impressed by the features, drawn to the design. There is a trend in buying pre-owned Rolex watches. It could be for any number of reasons, but perhaps the biggest reason is people are finally realizing that even investing in a used Rolex watch is a good idea. There are a lot of people who desire a used Rolex watch but are turned off by the idea of a shady dealer. But since you are here you should know there is no need to worry about that, we have an impeccable reputation to uphold. In fact, if you find you are not completely satisfied with your purchase, we offer an unconditional 30-day money back guarantee. And if you have any questions, we are more than happy to help. We will always do everything in our power to make you happy.